Czar is a large dark black/purple plum, with good astringency and ideal for culinary purposes. It can also be eaten fresh if you leave it to get fully ripe. Rated by Hogg (writing in the 1880s) as an "excellent plum". The blossom is unusually large for a plum. Please fill in the details below and we will let you know when Czar plum trees are back in stock. A good quality and cold-hardy early-season purple plum from Norway. An attractive new early-season dessert plum from Sweden, with large fruits and good cold-hardiness. Belle de Louvain is a large purple culinary plum, useful because it can be grown on north-facing walls. Haus-zwetsche is a damson-like Quetsche or Zwetsche plum, ideal for German-style cakes and desserts. Czar is in flowering group 3. Czar is self-fertile and does not need a pollination partner, although fruiting may be improved if there is a compatible tree of a different variety nearby. Since it flowers in the middle of the blossom season it can be pollinated by most other plum trees. Czar is an excellent choice for less than ideal conditions, including areas of heavy rainfall or low light levels. It is reliable, heavy-cropping, self-fertile, and can be grown shade or north-facing situations if necessary. The tree is compact and attractive. Czar has average disease resistance but good frost resistance. Czar was raised in Hertfordshire in the 1870s, UK, and is a cross between Prince Englebert and Early Rivers, and named in honour of the Emperor of Russia who was visiting England at the time. 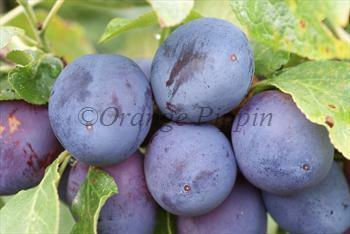 Czar has been quite widely grown in the UK as a commercial plum variety.